This guide is designed to aid in the creation of a user account and help you become familiar with the basic elements of FreshDrop. To register as a user, go to http://www.freshdrop.com and click on the Join Now Button in the upper left of the page. 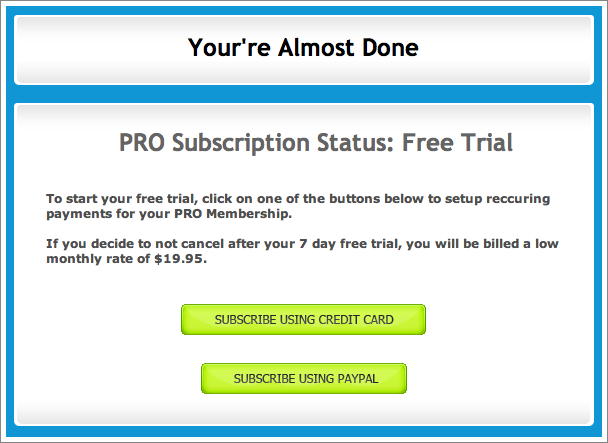 You will be directed to a new web page where an option for registering for a free trial of the Pro Membership resides. Scroll down and click on Start my 7-day risk-free trial, to be re-directed to a membership enrollment form. 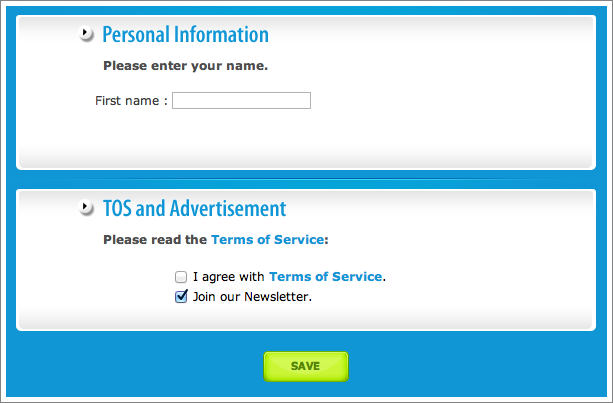 Begin by entering the basic information for your user account: Member Name, Email, and Password. This information will be used each time you log into FreshDrop and should be unique for enhanced security. Enter a First Name and then click on the box next to “I agree with Terms of Service.” once you have reviewed the Terms of Service. You will not be allowed to continue with the registration process unless this box has been checked. An additional option is provided for joining the FreshDrop newsletter. Check this option if desired and then click on the Save Button to continue. You will be redirected to a new page upon clicking on the Save Button. A form of payment must be entered to complete the registration. This information is used to set up recurring payments for the monthly fee to be charged after the free 7-day trial has expired. Click on Subscribe Using Credit Card to enter a credit card number or click on Subscribe Using PayPal to log into PayPal and set up monthly billing. You will be presented with a Credit Card Entry Form after clicking on Subscribe Using Credit Card. A purchase summary is located at the top of this form and shows the end of date of your free trial in addition to the amount you will be charged each month. The CVV is a three digit number that can be found on the back of your card and is required to complete the monthly payment upon trial completion. 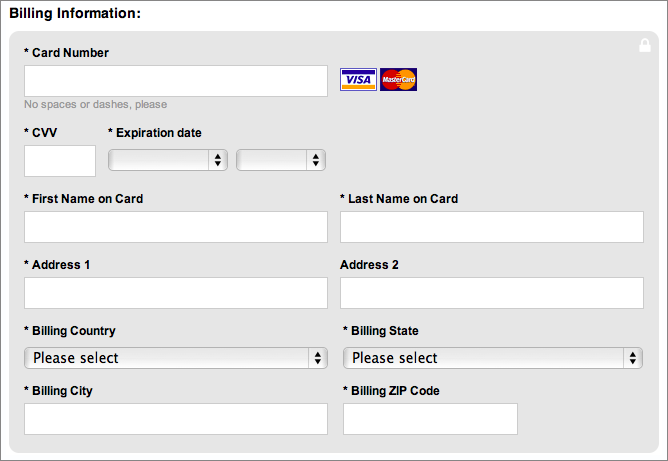 Contact information must also be entered for card verification and to ensure valid contact information is available. 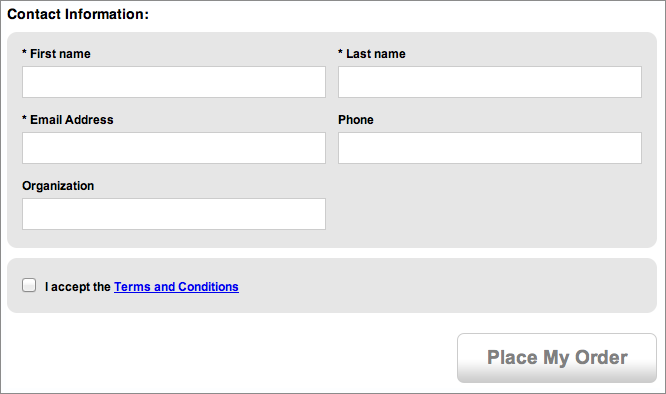 Only the fields with a star (*) are required to complete the registration process. Click on Place My Order once the card information has been entered and the box next to “I accept the Terms and Conditions” has been checked..
You will be redirected to a Pro Subscription Success page. 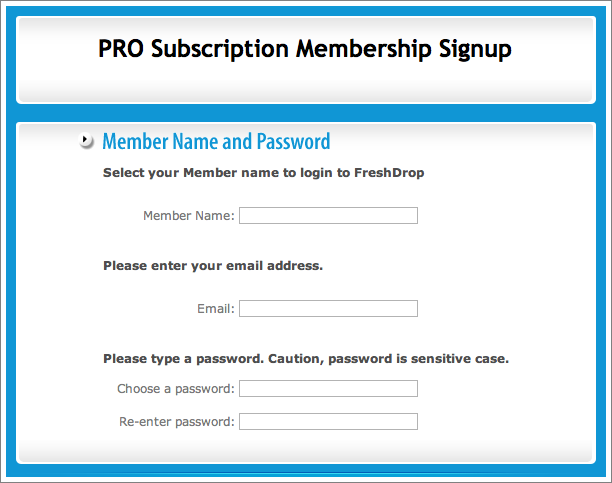 Click on the Login Button at the bottom of this message to enter your account information and begin using FreshDrop as a Pro Subscriber. After clicking on Subscribe Using PayPal, you will be redirected to a log in page for completing the setup of recurring monthly payments through PayPal. A table containing a detailed description, the terms, and the amount to be charged at the end of the trial appears at the top of this page. Be certain to review this information and be aware of the trial end date before completing the log in process. Enter your PayPal email and password and then click on the Log In Button located in the bottom right corner of the page to be directed to a review page. 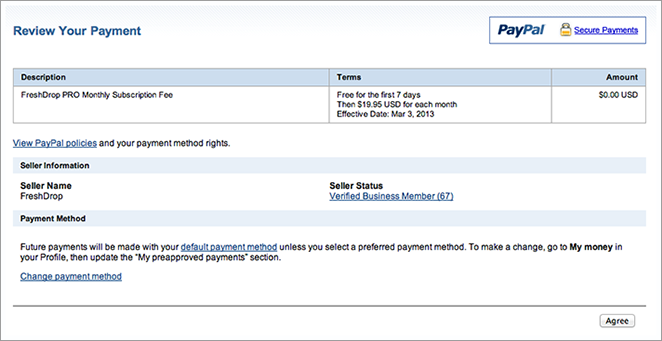 Review the payment terms shown on this page and then click on the Agree Button in the lower right corner to continue. 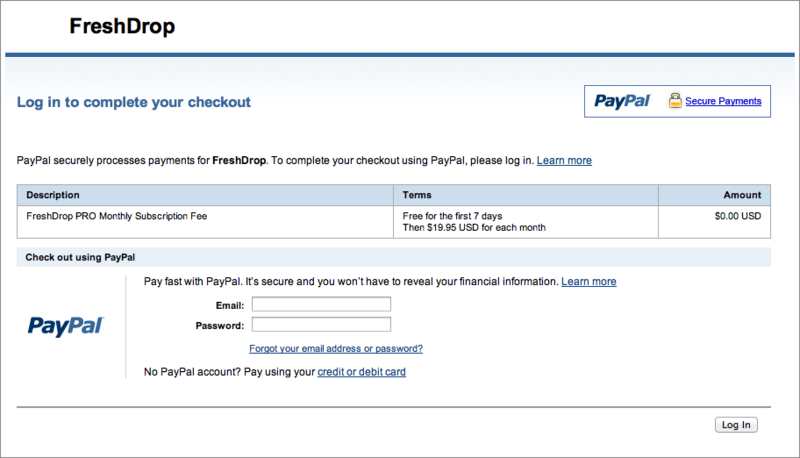 To log into your account, go to www.freshdrop.com and click on the Login Button located in the top right of the page. Enter your User Id and Password in the login prompt and then click on the Login Button. 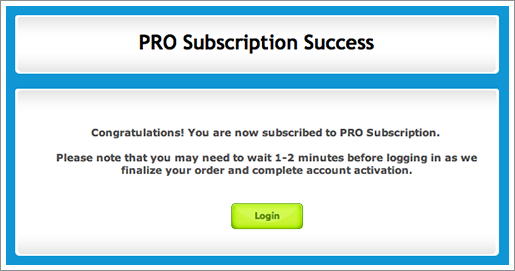 Signing in with your account allows you to have access to Pro Subscription features that would otherwise not be available. If you have not created an account, click on the Signup Button to begin the registration process for a free 7-day trial of the Pro Subscription. This prompt will close after clicking on the Login Button and you will be able to access all features of the FreshDrop application. After successfully logging in with your account information, you will be presented with the main application page, as shown below. This screen is divided into three basic grids: Data Feed, Quick Filter, and Results. The Data Feed Grid is used to select a defined marketplace for the shown results and the Quick Filter Grid can be used to search for a specific type of domain name. You will see results based on these and additional selections in the Results Grid located at the bottom of the page. 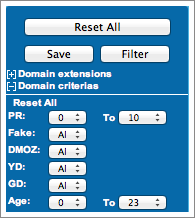 A Search Field is located above this grid and can be used to find a specific keyword within the supplied results. A Filter Tool is also provided on the right hand side of the Results Grid and can be used to further refine the currently shown results. Additional options are supplied directly above the Results Grid and include the ability to save multiple sets of results, export a page, and page viewing capabilities. Use the button selections in the upper right of the screen to log in or out of the application, view account information, access support features, and communicate with our FreshDrop representatives. You are now ready to begin using FreshDrop to remain current on recently expired domain names and make profitable purchases. Happy searching!